The Japanese countryside faces multifaceted uncertainties in the 21st Century as Japan’s constitutional democracy is undergoing a major transition after decades of political dominance by the rural-based Liberal Democratic Party. Fiscal retrenchment has been affecting beneficiaries of agricultural supports, social welfare, and other income transfers, including fiscal arrangements for rural municipalities, as another wave of local government amalgamation is already underway (See Chapter 8 by Ouchi, Ujiie and Odagiri). Agricultural policy is on the defensive, trying to assert the legitimacy of its social and environmental benefits for the whole country. The effects of the de-industrialization of Japan have overshadowed the economic well-being of rural Japan. Japanese agriculture is no longer the most important food source for daily living, and the GDP share of agriculture dropped from 13% in 1960 to under 2% in 2000. The rural population declined both in proportion and in absolute numbers since 1960, with under 5% of the national workforce in agriculture in 2000. More recently, the agricultural and rural policy anchored in the 1961 Agricultural Basic Law was replaced only in 1999 with a new policy emphasis on national food security. Japan’s national leaders have increasingly relied on western ideas, methods and techniques to achieve a “quick and cheap” modernization since the beginning of the Meiji transformation in the 1868 to become a member of the advanced economies as quickly as possible. Equity and quality of life concerns were suppressed for the sake of nation building. The central government chose top-down policies to support local rural economies mainly through agricultural subsidies and infrastructure development. The upper-level local government (forty-seven prefectures) undertook modernization initiatives, but the lower-level local government in cities, towns, and villages became the real force for rural development and safeguarding people’s livelihood. Early Meiji policies continued the Tokugawa focus on food production especially rice. Nevertheless, by the first decade of the 20th century, domestic production of rice fell behind the needs of the growing population. Japan colonized Taiwan in 1895 following the Sino-Japanese War and Korea in 1910 following the Russo-Japanese War. As rapid industrialization and urbanization increased the demand for rice, imports from these colonies increased gradually to account for nearly one sixth of Japanese consumption by the mid-1930s. With the food problem alleviated by imports, the focus of agricultural policy for mainland Japan shifted to the poverty problem (Hayami, 1988, pp. 37). National laws and regulations to support local efforts for combating rural poverty and economic depression were designed and implemented in the late 1910s and 1920s, and included the Reclamation Assistance Law (1919), the Rice Law (1921), the Tenant Conciliation Law (1924), the Regulations for Establishing Small Owner-operated Farms (1926), to name a few. The Ministry of Agriculture and Forestry (MAF) was separated from the Ministry of Agriculture and Commerce in 1925. The Industrial Cooperatives Law was enacted as early as 1900, modeled after the German system of cooperatives. After a rather top-down campaign to involve rural elites (resident landlords and upper class farmers) rather than poor farmers, agricultural cooperatives eventually spread nationwide by the 1920s to become a strong institution of rural solidarity against economic depression. The WWII era resulted in a serious food crisis. By August 1945, the non-farm population was barely subsisting under the food rationing system established in 1941. Food supply lines from abroad were interrupted, and domestic production capacity was severely damaged by shortages of labor, fertilizer, and other input materials. In 1945, food supply per capita had collapsed to nearly half the level of the prewar average of around 165 kg of rice per year. Economic reconstruction measures began as soon as the Allied General Headquarters in Tokyo felt no threat to its authority. Land reform, dissolution of the zaibatsu, and labor reform comprised the three big reforms. Rural poverty, especially the misery of tenant farmers, was a high priority. The agricultural land reform was designed to enhance production but played a crucial role in democratizing rural Japan (Dore, 1959). Implemented in two stages, two million hectares of farmland (one third of the total farmland) were transferred into the hands of cultivators by 1950. This reform placed a ceiling of 1 ha of land that could be rented by an owner-farmer or a resident landlord (4 ha in Hokkaido) and it abolished absentee ownership of farmland. The ratio of tenanted land to total farmland was reduced quickly from 46% in 1941 to 13% by 1949 and down again to 9% by 1955 (Kayo, 1977, p. 66). Compensation to previous landowners was next to nothing because of hyper-inflation in the postwar economy. The revitalization of agricultural production was phenomenal, as Japan became a model of small family farm development (Johnston and Kilby, 1975). The labor supply in rural Japan increased with more than a million ex-soldiers and repatriates engaging in agriculture. Through the reorganization of Agricultural Cooperatives, the establishment of the Rice Price Deliberation Council, and the development of a research and extension system, government measures helped agriculture take the lead in reconstructing the national economy. Public investment revitalized irrigation and land reclamation projects. The war food crisis had reminded the public that agriculture was the backbone of the country. The immediate goal of self-sufficiency in rice was achieved, practical speaking by 1955, and production continued to increase until the mid-1960s. Regional development policy was structured around the concept of river basin resource management using the Tennessee Valley Authority approach as the model. Multi-purpose dams constructed throughout the country reduced flood damage, generated electricity, improved irrigation systems, and supplied water for municipal and industrial uses. The general economic recovery was designed under the rather austere guidelines called the Dodge Line released in early 1949. It called for balanced budgets, efficient taxation, wage stabilization, effective food supply controls, and improved trade and foreign exchange controls. However, the real recovery of the industrial sector was propelled by the Korean War that both boosted Japan’s economy and introduced American hegemony to East Asia, which further accelerated Japan’s upward movement in the global economy (Cumings, 1987). The key to high economic growth during this period was industrialization and urban concentration, the latter a result of a nation-wide amalgamation of cities, towns, and villages following the 1953 Town and Village Amalgamation Promotion Law. Factories, mills and offices opened at an unprecedented rate across Japan and massive rural to urban migration was well underway by the late fifties. In 1960, the Ikeda Cabinet stepped up the intensity of growth policies with the National Income Doubling Plan. In 1964, Japan joined the Organization for Economic Cooperation and Development (OECD) and hosted the Olympic Games in Tokyo. The goal to double national income by 1970 was outpaced by the economic growth actually achieved. Between 1961 and 1970, the average annual growth rate was 10.7% in real terms. The first national-level plan for development coordination, the National Comprehensive Development Plan (NCDP), was issued in 1962. Although industrialization remained the emphasis, this first NCDP gave greater consideration to the distribution of growth than had the Income Doubling Plan. By selecting new growth poles in underdeveloped areas throughout the country, the NCDP tried to prevent widening regional imbalances (Shimokobe, 1981; Samuels, 1983; Calder, 1988). Despite this good intention, the economic polarization between the "Pacific Ocean Belt" megalopolis and the rest of the country continued. The relative "success" of the initial small family farm strategy in the late 1940s would not last long. The post-war land reform structure was perfectly egalitarian but not flexible enough for achieving agricultural modernization. In 1961, the Ministry of Agriculture launched an ambitious restructuring plan with the passage of the Basic Agricultural Law that promoted specialization and rationalization aimed at creating "viable farms" large enough to succeed without requiring off-farm wage employment or government subsidies. This goal was not realized except in Hokkaido where traditional institutions such as shuraku did not limit farm size and virgin land was available for cultivation. 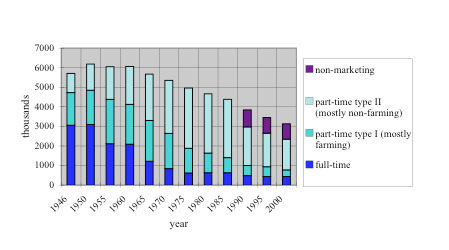 Small, fragmented patterns of farmland ownership and operation throughout the rest of Japan continued, with the majority of farm families choosing to become even more part-time (Kada, 1982; Jussaume, 1991) (see Figure 1). Farming became a supplementary activity for families, principally under the care of married women and older men. New labor-saving technologies such as small rice planters and power cultivators helped this transition, but fearful of losing their most important family asset, virtually no family opted for leasing or selling farmland to others. Ultimately, productivity increases in agriculture were no match for those in the manufacturing and service sectors. Source. Japan Statistical Association (1987) Historical Statistics of Japan. Vol. 2 p. 33; '85 Pocket Norin 96, p. 122; '90-2000 Pocket Norin 2002 p. 128. Despite the rapidly dwindling role for agriculture in farm incomes, political pressure pushed the government to raise the level of price support for rice with a goal to achieve income parity between farm and non-farm households. Agricultural cooperatives and other farm organizations formed such a strong interest group that rural votes became the reliable base for successive postwar conservative governments lead by the Liberal Democratic Party. By 1965 after a series of annual increases of producer prices of rice, Japan became the leading industrialized country in level of support and protection for agriculture (Hayami, 1988, p. 5; Calder, 1988, p. 268). This had not been the case during agricultural reconstruction following WWII. In 1955 levels of agricultural protection were higher in other advanced economies than in Japan. Japanese farmers had long used intensive farming systems to grow other field crops such as wheat or barley in rotation with rice, and buckwheat or soybeans in dry fields, but these practices had almost disappeared by 1970 as these crops received relatively less protection and support compared to rice, and therefore could not compete with imports. A similar dramatic decline of production of timber and silk cocoons was seen during this period. The overall result was excess capacity in rice production. By the late 1960s, the adverse effects of rapid economic growth were becoming apparent. Concerns with pollution and public hazards led to the enactment of environmental legislation and the creation of the Environmental Protection Agency in 1971. The New City Planning Law was enacted in 1968 to control urbanization. The Agricultural Promotion Area Law of 1969 was established to protect good farmland with a permission system for transfer and conversion of agricultural land for urban and industrial use. Public concern for underdeveloped regions led to special area legislation such as the Mountain Village Development Law of 1965 and the Depopulated Areas Special Measures Law of 1970. Nevertheless, the second NCDP, issued in 1969, held the course with major growth themes at the national level, such as the construction of the bullet train and freeway networks, combined with large-scale industrial development in selected underdeveloped areas. The excess capacity in rice production became a financial problem for the government. The postwar investment in reclamation, land and irrigation improvement combined with technological progress and institutional innovations with cooperatives began to bear fruit in the 1960s, but weakness on the demand side began to emerge as Japanese dietary patterns changed due to westernization and affluence. Per capita consumption of rice declined steadily while consumption of meat, fruits and vegetables increased. Years of strict administrative control over rice production and marketing made the concept of demand and supply adjustment alien to Japanese rice farmers and politicians alike. Producer prices for rice actually exceeded consumer prices by the end of the sixties, enabled by the political importance of rural votes. This negative margin on government rice prices and the cost of stock management, which had to be paid for by taxpayers, became the dominant component in the MAF budget. Facing these difficulties, MAF began production control measures for rice and announced in 1970 a new policy direction called sogo nosei (comprehensive agricultural policy). Though heralding the “structural improvement of agricultural, forestry, and fisheries communities,” significant sums of tax-payers' money actually became available for non-agricultural applications of rural infrastructure such as roads, sewage, drinking water, community halls, children's parks, and sports grounds. In effect, rural revitalization began to displace the focus on agricultural development. In the early 1970s, two factors necessitated the modification of development planning. The first was land speculation and the consequent land development boom throughout the country, spurred by Tanaka Kakuei's "Japanese Archipelago Remodeling Plan" in 1972. The second factor was the 1973 oil crisis that shook the basic assumption of cheap energy to drive high growth rates. In 1974, Japan experienced its first negative GNP growth rate in the postwar period. Escalating land prices resulted in the creation of the National Land Agency (NLA) in 1974 together with the enactment of the National Land Use Planning Law. Authorized to coordinate and supervise land use planning and related issues at the national level, the NLA became the lead agency for the preparation of the NCDP, a task previously undertaken within the Prime Minister's Office. The growth of metropolitan regions slowed down by the mid-1970s. The population of large cities continued to grow, due more to natural demographic changes than to migratory increases. Even so, some inner-city areas in the metropolitan regions observed a net population loss as “U-turn” migration from a metropolitan region to one’s home town and “J-turn” migration to a city in the vicinity of one’s home town or village became noticeable. The emphasis on policy guidance for regional development shifted to the concepts of balanced and environmentally-sound growth and to the enrichment of social and cultural life in both urban and rural areas. The third NCDP issued in 1977 replaced the former growth strategy with a population redistribution strategy aimed to discourage population concentration in larger cities and to enhance the livability and viability of smaller cities, towns, and villages. Its ideal of balanced growth in harmony with nature, local history and culture appealed more to the national elites than to ordinary rural residents, as regionalization and regionalism were advocated by leading intellectuals and practitioners in planning. Rice producers continued to receive increases in price support levels, as much as 30% in 1974, even after the oil price shock. Nevertheless, the cost of supports for both rice production and non-production began to be acknowledged as one of the big three sources of the national current account deficit along with the National Railroad and National Health Insurance. 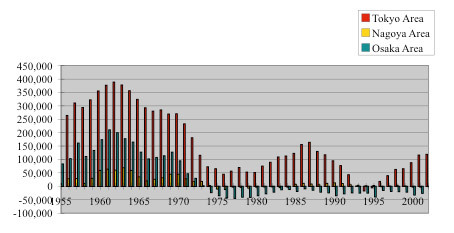 The Council of Administrative Reform under Doko Mitsuo's powerful chairmanship advocated a retrenchment of public spending, but it took until 1982 to hold to the level of the previous year in nominal terms the total budget of the Ministry of Agriculture, Forestry and Fisheries (MAFF), whose official name changed to incorporate fisheries in 1978. Foreign pressure to open up domestic commodity markets had already started the process of policy innovation in agriculture in the 1970s. The list of agricultural commodities protected by the import quota system were reduced drastically to 22 items by the mid-1970s, and in 1978 mainly due to U.S. pressure, beef and fresh orange markets were opened further despite strong opposition from producers. By 1984, Japan had become the world’s top food importer. Overall food self-sufficiency declined sharply to 53% in 1985 from 73% in 1965 (supplied calorie basis). Even Japanese food capitals in processing, distribution and catering began to increase their reliance on foreign products (McDonald, 2000). The downward trend of agriculture as a sector in the economy and of farming as an occupation went uninterrupted in this period of recession and slower growth. For instance, the ratio of agricultural income to the total household income of farm families declined from 48.0% in 1965 to 33.6% in 1975, and still further to 19.4% by 1985. And yet, as the Japanese economy shifted from heavy industry to a combination of high-tech and light industries plus automobile, machinery, and steel (Dore, 1986), this trend toward a more decentralized industrial structure contributed to the stability of part-time farming. Although the government advocated the use of lease agreements for enlarging farm size, the majority of part-time farmers were reluctant to lease their land. Even the government’s idea of group farming was not well received by farm families. The year 1985 marked a clear departure of public policy in Japan from a pro-distributive, anti-globalization orientation to a pro-globalization attitude. The sharp rise of the Yen in 1985 triggered a massive outflow of manufacturing capital abroad and necessitated labor restructuring at home (Douglass, 1988; Edgington, 1994). Calls for greater efficiency, privatization, and deregulation prepared the basis of the Japanese “bubble” economy. The government’s redistributive focus waned but not because the problem of uneven development had disappeared. On the contrary, if anything, rural/metro disparity continued to increase with migration to the three metropolitan regions on the rise again. Some severely depopulated areas started to observe negative growth rates due to the aging of remaining populations. The growth of Tokyo alone was conspicuous (see Figure 2). With the coming era of globalization, foreign companies not only established their branches and associates in Tokyo, but some Japanese companies also relocated their headquarters to the greater Tokyo area. This renewed interest in Tokyo's limited space triggered another land boom, which by decade’s end began to spread into the countryside. Released in April 1986, the "Maekawa Report" by the Advisory Group on Economic Structural Adjustment to Prime Minister Nakasone proposed a drastic reorientation of the Japanese economic structure to reduce tensions with international trade partners. The proposed measures aimed to increase domestic demand, enrich consumer life, and improve housing conditions and other infrastructure. This proposal legitimized relaxation of public spending, i.e., for large projects in metropolitan areas. The fourth NCDP, approved by the cabinet in June 1987, departed significantly from preceding NCDPs, which adhered to the goal of regional balance in national development planning (Okuchi, 1985; Takahashi, 1987; Sasaki, 1990). The fourth plan used the catchphrase “multipolar and decentralized spatial structure” to convey the goal of regional balance; However, the new plan’s concrete measures were characterized by urban bias, efficiency orientation, and big business favoritism. The Minkatsu (privatization promotion) Law of 1986 provided monetary and physical incentives for the private sector to participate in public works projects. The Resort Development Law of 1987 spread the construction and development boom to the metro-adjacent countryside. Plans for golf courses, ski resorts, marinas, etc. pushed up land prices in rural areas, threatening the local economy and the environment. Each ministry with vested interests in regional development devised a specific planning campaign to support local involvement in the new national political and economic environment: Technopolis, Science City, Greentopia, and Teletopia, to name a few. The notorious “vertical administration” of Japan contributed to this multiplicity of planning ideas in the 1980s (Samuels, 1983; Edgington, 1989). For many rural localities, furusato-sosei (home-place making) projects initiated by Prime Minister Takeshita functioned to pacify the anti-Tokyo sentiments (Sasaki 1990). In contrast to other top down development initiatives, furusato-sosei gave municipal governments freedom to plan and implement public projects valued at up to \100 million. This policy was a good test of local level inventiveness, though its main achievement in hindsight was to mitigate criticism against the central government for doing little to control the unipolar concentration of growth in Tokyo. The position of agriculture in the national economy and MAFF’s importance and influence in the state bureaucracy steadily declined during this period, while problems facing rural areas remained unsolved. The urban majority was not as generous as before toward agricultural subsidies and border protection. Following two consecutive years of zero increase, the producer price of rice was actually lowered in 1987 by 5.95% relative to the previous year’s price. Public works spending for depopulated rural areas became an easy target for criticism. International and domestic pressure for trade liberalization put the minority of professional farmers into a corner. As aging advanced in rural areas, the rate of decline in the number of farm households accelerated. During this bubble period, the most important role of the farm sector may have been to hold much of the agricultural land in the hands of more than three million family farms. The speed of land conversion from agriculture to non-agricultural uses accelerated again in the late-1980s. The Basic Land Law enacted in 1990 did little to curtail land speculation, and the NLA was finally abolished in December 2000. Along with conversion from agricultural to non-agricultural uses, the area of unfarmed land increased steadily. During the 1980s, Japanese Diets unanimously voted three times for a closed- door policy for rice, reflecting not only farmer sentiments but also consumer support for domestic rice (Yamaji and Ito, 1993). However, the unexpected record-poor harvest (crop index as low as 74%) in 1993 necessitated an emergency rice import from abroad. When the GATT Uruguay Round was concluded in December 1993, Japan had to accept a partial opening of its rice market, although rice was still exempted from the tariffication list. A new Food Law that passed the Diets in December 1994 emphasized flexibility and a reduced role for government in the supply adjustment and distribution of rice. Refocusing on income problems in hilly and mountainous areas and away from commercial rice production, MAFF instituted the “direct payment” method of supporting agriculture and rural communities in anticipation of further trade liberalization. The Basic Law on Food, Agriculture, and Rural Areas was enacted in 1999 to replace the 38-year old Basic Agricultural Law of 1961. Large-scale public development plans as well as private resort development plans collapsed as the bubble economy burst. Yet, nobody in the early 1990s expected that the recession would last into the next century. Characterized by political stalemate, the 1990s became known as the lost decade for the Japanese economy. The prolonged recession made many people reevaluate agriculture or things rural in terms of a valued way of life. Many who left rural towns and villages in their youth but also young city-born people queued up for opportunities to start a new country life, coining a new term “I-turn” to describe migration of city-born people to a rural place. The number of entrant farmers increased partly to reflect this new trend, yet farm “natives” who began farming upon retirement from office or factory jobs outnumber these newcomer entrants (Sawada, 2003). MAFF now welcomes both I-turn and J-turn farmers in collaboration with rural municipalities and agricultural cooperatives, probably with a hope to alleviate the aging farm population. Following the first case of BSE in Japan in September 2001, other incidents began to shake consumer trust in agricultural policy and producer confidence: Cases of food poisoning, false labeling, illegal food additives, chemical uses in agriculture, and so forth regularly made the headlines. Although always under the jurisdiction of the Ministry of Health, MAFF began to promote food safety within a consumer-focused approach to help restore confidence in the food chain. Apart from media events such as Ministers’ eating domestic beef, new product tracing systems were instituted, such as for tracing beef and dairy cattle from birth to the consumer. Information on production practices for fruits, vegetables, and rice became an important component of the “safe” food policy. MAFF tried to utilize this new emphasis on food safety, including the slow food movement, as one way of adding value to domestic products. The name of the Ministry remains the same but in reality its current function could justify a change to the Ministry of Food Safety or Food Security. Together with the image of safe food, MAFF and other farm organizations also emphasized the role of agriculture as the guardian of the environment for the whole nation. Aiming in part to prevent a drastic public spending cutback, MAFF adopted the argument of the multiple function of agriculture known as multifunctionality in Europe where the concept originated (Parris and Melanie, 1993). The integrity of the land, water, and climatic conditions of the Japanese Archipelago depends on the “external” benefits of agriculture as well as flood prevention, river flow stabilization, land-slide and soil erosion prevention, and provision of recreational value for the entire population (MAFF, May 2003). Moreover, agriculture and the rural way of life become a sine qua non in promoting tourism in rural areas (Creighton, 1997). As rural manufacturing and construction jobs dwindled with agriculture, tourism was viewed as one of the last resorts to bring in money from metropolitan areas to the countryside. Rural areas in other advanced economies such as Canada share Japan’s problems arising from global commodity surpluses, farm adjustment, environment and resource deterioration, depopulation, aging, and social and economic deprivation. Policy to address these problems must be built on a solid understanding of the nature of rural restructuring, especially since rural areas are not immune from the global process of urbanization and shift to the knowledge economy from industrialization. Rural revitalization planners at the local level know they cannot advocate a return to the "good old days”. However, politicians and national ministries of agriculture may not share the same understanding. Certainly efforts for self-reliant revitalization and endogenous development in small localities are well received and morally supported by national elites in Japan, as they are in many countries. But only when and if the historically strong paternalism of the national government of Japan recedes may leaders in rural localities become more self-confident, critical, and prudent. This chapter has traced the evolution of national level rural policy and the changes in the forces operating on the rural economy of Japan from postwar reconstruction to the present. As the agrarian nature of this economy receded with the emergence of the industrial and service economy so the features of devitalization changed. Investment, employment, production and incomes of rural Japan, the main economic ingredients of devitalization, are now dominated by the new rural economy. By 1945, national and rural food shortages, poverty, supply and distribution of agricultural inputs, land tenure issues, governance and investment weighed heavily on rural vitality. Over the next 10 years of heavy American influence, the rural economy bounced back under policy instruments better described as reform measures, with land reform and cooperatives assuming the highest profile for rural revitalization. By 1960, the Japanese government had reassumed many of the powers needed to assert its sovereignty over domestic policy. Major building blocks for the national policy framework were put in place in the early 1960s, including the Agriculture Basic Law and the first National comprehensive Development Plan. However, the nature of the forces operating in rural Japan kept changing. Farm incomes and, through the multiplier effect, rural incomes were supported artificially through rice price supports, yet agriculture declined steadily as an employer and contributor to GNP and food security. Rural areas benefited from industrial and manufacturing investment and transportation infrastructure. As Japan became more and more integrated into the global trading and financial systems, capital flows, energy prices, imports and job losses with off-shore out-sourcing brought instability into land markets. The profitability of small and medium sized rural manufacturing firms suffered and dampened reinvestment. Therefore, the range of policy measures needed for revitalization widened at the same time as rural-specific, and especially agricultural policies became less and less relevant for good outcomes for rural people. The policy emphasis increasingly looked like mitigation or compensatory policy as opposed to revitalization measures. Restructuring and reorganizing the Ministry of Agriculture, Forestry and Fisheries seems to have been less relevant to revitalization at the same time as trade liberalization and globalization of knowledge continued to marginalize rural prosperity. The saving factor for rural economies appears to have been the loyalty of successive LDP governments to their strong rural constituency, which helped to sustain municipal finance, employment and standards of service to rural people. Chronic national deficits, a struggling economy, and the emerging political shift to urban constituencies by the end of the 1990s contributed to dismantling this affirmative spending and investment approach to the rural economy. Instead a new focus was built around cost reduction for local government, special project funding programs for local initiatives, and community development similar to other OECD countries. Currently, national preoccupations with geo-political issues, fiscal and monetary policy, trade and finance policy, and social services for health, education and old age set the policy conditions for rural revitalization. Revitalization efforts have to work within these conditions, though decisions to address these issues are based on national public interest, not rural interests. Some may see this story as an erosion of legitimacy for public support for rural well-being and interpret the present state as an inevitable outcome of subordination to the center. Others may argue that departure from dependency and subsidy was long overdue and that the present situation must be taken as a great opportunity for small localities to define what is good and necessary and to look for real allies and partners. Both interpretations may be valid. Nevertheless, more economic opportunities need to find their way into rural localities through markets and enabling policy, which means that local leaders and citizens in general have to make tough choices themselves. The age of technocratic planning is over. Rural revitalization requires empowerment of local level governments as well as civil societies. This empowerment would be the true test of whether grassroots democracy begun in the Meiji period, given a heavy boost after the Second World War and now shaking up the rural/metro balance of political power has taken root in postwar Japan. Calder, K. E. (1988). Crisis and Compensation: Public Policy and Political Stability in Japan, 1949-1986. Princeton, NJ: Princeton University Press. Creighton, M. (1997). Consuming rural Japan: the marketing of tradition and nostalgia in the Japanese travel industry. Ethnology, 36, 239-54. Cumings, B. (1987). The origins and development of the Northeast Asian political economy: industrial sectors, product cycles, and political consequences. In F.C. Deyo (Ed. ), The Political Economy of the New Asian Industrialism (pp. 44-83). Ithaca, NY: Cornell University Press. Dore, R. P. (1959). Land Reform in Japan. London: Oxford University Press. (Reprinted in 1985). Dore, R. P. (1986). Flexible Rigidities: Industrial Policy and Structural Adjustment in the Japanese Economy 1970-1980. Stanford: Stanford University Press. Douglass, M. (1988). The transnationalization of urbanization in Japan. International Journal of Urban and Regional Research, 12, 425-454. Edgington, D. W. (1989). New strategies for technology development in Japanese cities and regions. Town Planning Review, 60, 1-27. Edgington, D. W. (1994). The geography of Endaka: industrial transformation and regional employment changes in Japan, 1986-1991. Regional Studies, 28, 521-535. Hayami, Y. (1988). Japanese Agriculture under Siege: The Political Economy of Agricultural Policies. New York: St. Martin's Press. Johnston, B. F. and Kilby, P. (1975). Agriculture and Structural Transformation: Economic Strategies in Late-Developing Countries. New York: Oxford University Press. Jussaume, R. A., Jr. (1991). Japanese Part-time Farming: Evolution and Impacts. Aimes, Iowa: Iowa State University Press. Kada, R. (1982). Trends and characteristics of part-time farming in post-war Japan. GeoJournal, 6, 367-372. Kayo, N. (Ed.). (1977). Nihon Nogyo Kiso Tokei [Basic Statistics of Agriculture in Japan]. Tokyo: Norintokeikyokai. McDonald, M.G. (2000). Food firms and food flows in Japan 1945-98. World Development, 28, 487-512. Ministry of Agriculture, Forestry and Fisheries (2003). Why agriculture needs different treatment in trade rules? Fact Sheet No.1. Available from (http://www.maff.go.jp/eindex.html). Nihontokeikyokai [Japan Statistical Association] (1987). Nihon Choki Tokei Soran [Historical Statistics of Japan]. Vols. 1, 2. Tokyo: Nihontokeikyokai. Okuchi, S. (1985). Gendai Nihon no kokudo kaihatsu seisaku [National land development policy in modern Japan]. In Oyabu Teruo, Okuchi Sho, and Koga itsuhide (Eds. ), Gendai Nihon no Shihonshugi [Modern Japanese Capitalism] (pp. 145-175). Tokyo: Yuhikaku. Parris, K. and Melanie, J. (1993). Japan’s agriculture and environmental policies: time to change. Agriculture and Resources Quarterly, 5, 386-399. Samuels, R. J. (1983). The Politics of Regional Policy in Japan: Localities Incorporated? Princeton, NJ: Princeton University Press. Sasaki, M. (1990). Chiiki kaihatsu to hojokin [Regional development and subsidies]. In Miyamoto Kenichi (Ed. ), Hojokin no Seijikeizaigaku [The Political Economy of Subsidy] (pp. 172-208). Tokyo: Asahi Shinbunsha. Sawada, M. (2003). Shuno Route Tayouka no Tenkai-Ronri [The Diversification Mechanism of Engagement in Farming]. Tokyo: Norintokeikyokai. Shimokobe, A. (1981). Thirty years experience in development planning: a reflection. In H. Nagamine (Ed. ), Nation-Building and Regional Development: the Japanese Experience (pp. 137-149). Nagoya: United Nations Centre for Regional Development. Statistics Bureau. (2002). Internal Migration in Japan derived from the Basic Resident Registers. Heisei 12. Available from (http://www.stat.go.jp/data/idou/2002np/ zuhyou/a013.xls). Takahashi, A. (1987). Noson seisaku to noson mondai [Rural policy and rural problems]. In Hasumi Otohiko, Yamamoto Eiji, and Takahashi Akiyoshi (Eds. ), Nihon no Shakai [Japanese Society] (Vol. 2, pp. 83-118). Tokyo: Tokyo University Press. Yamaji, S. and Ito, S. (1993). The political economy of rice in Japan, In L. Tweeten, C.L. Dishon, W.S. Chern, N. Imamura, and M. Morishima (Eds.). Japanese & American Agriculture: Tradition and Progress in Conflict (pp. 349-365). Boulder, Colorado: Westview Press.